14 people attended the meet at Carrbridge. 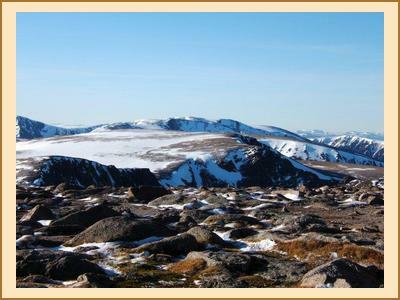 A very frosty Saturday morning saw people head off in various directions but mainly in the direction of the Cairngorms. A large party headed to the Cairngorm car park to tackle the south side of Cairngorm itself and then headed down to the Saddle and continued on to Bynack More and then headed down to Ryvoan and back to a strategically placed car. 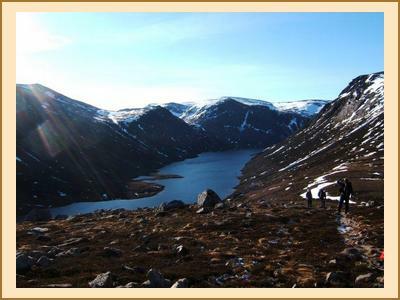 The Cairngorms were almost devoid of snow after nearly a week of thawing. Only patches in the hollows and gullies which after an overnight frost were in great condition. The other party (solo) saw the President also head to the Cairngorm car park for what was rumoured as an endless but exhausting walk around the said car park. In truth an ascent of Lurcher's Crag was made and then a wander up on to Cairn Lochan via Lochan Buidhe and back via Lurcher's gully track followed by the inevitable visit to the coffee shop. Alison C. and Gillian headed for a remote and possibly the most boring Corbett - Carn na Saobhaidhe in the middle of the Monadhliadh using a combination of bike and foot. To avoid the chaos in the kitchen with its four cooker rings, five headed down to an hotel for an evening meal. Back to the hostel for the usual 'fooding and drinking' ritual without which the E.M.C meets would not be the same. So Sunday is a mystery? For the record, I think Gillian, Fiona and Ron tackled the Ben-y-Vrackie Sudwand and the Pres. tackled the easy grassy slopes of Meall nan Caorach. a Graham near Amulree.